In ECHAM4, SCF is calculated from the prognostic SWE without taking into account the vegetation and the orography (Section 2). The major goal is to develop a more sophisticated yet still compact relationship between SCF and SWE which accounts for different vegetation types and orography. 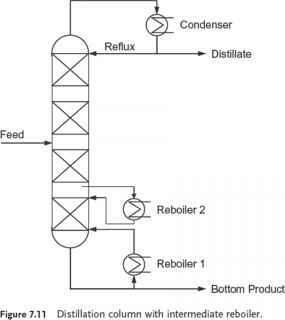 The new parameterization should be simple to save computing time and, furthermore, use only surface boundary fields which are typically available in GCMs such as roughness length, forest fraction and leaf area index. Before developing a new parameterization, it is useful to review available relationships between SCF and SWE: In most land-surface schemes, SCF is derived from the prognostic SWE. Several approaches account for varying vegetation roughness. Only a few expressions, however, take into account the reduction of surface albedo due to subgrid-scale orography, e.g., over rough mountainous regions (e.g., Douville et al., 1995a and Walland and Simmonds, 1996). Quantitatively, large differences between the existing parameterizations are found. For example, in Fig. 1, the relationship between the SCF and the SDH used in five climate models is shown. 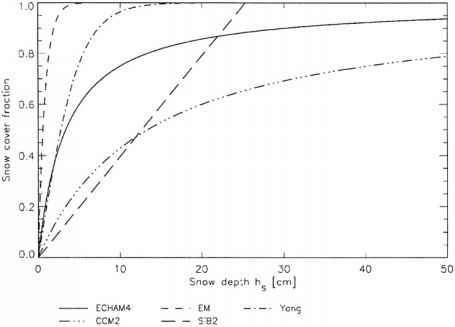 For a snow depth of 5 cm, the 2nd version of the NCAR climate model (CCM2, Marshall et al, 1994) computes snow cover fraction fs = 0.20 while in the "Europa-Modell" of the German Weather Service (Edelmann et al, 1995), the grid box is almost completely snow covered (fs = 0.998). Part of the variations may be due to the fact that they are used in models with different resolution. Nevertheless, Fig. 1 suggests that the SCF is calculated with large uncertainties in climate models. In the following sections, new parameterizations for the calculation of the snow cover fractions over (i) flat, non-forested areas, (ii) mountainous, non-forested areas and (iii) forests are presented. This partition reflects the fundamentally different characteristics of snow cover in forests and non-forested areas,as well as between flat and mountainous regions, respectively. Finally, it is shown how these parameterizations are blended into a short, compact formula for use in land surface schemes.